By BoltBait, July 27, 2014 in Plugins - Publishing ONLY! I was playing around with the Steganography plugin in order to improve the quality of the hidden images. 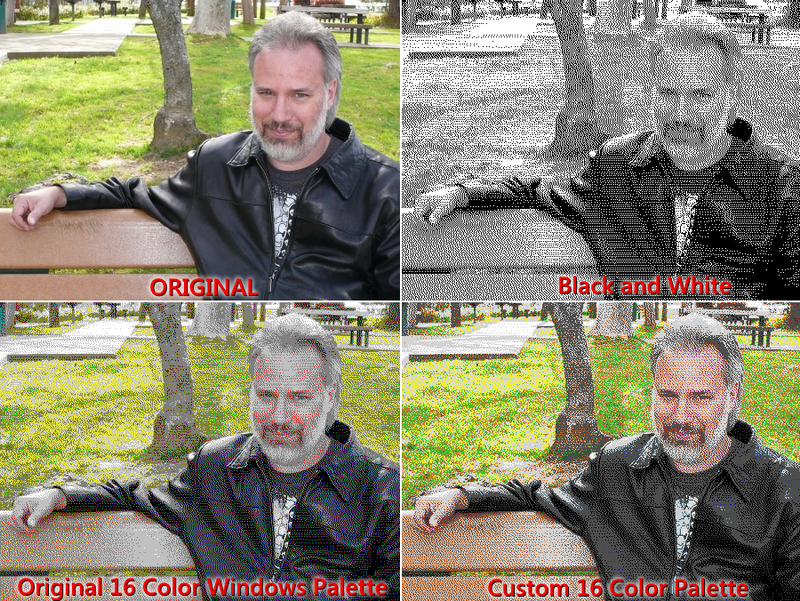 I ended up adding in Floyd-Steinberg dithering to the hidden image which greatly improved the quality of the hidden image. Dithering reduces the number of colors of an image by choosing the closest color in the palette for a pixel, then taking the difference between that chosen color and the original color and spreads that difference out to the nearby pixels that haven't been processed yet. Normally, paint.net breaks up your effect into multiple threads to complete the job faster. But, because of the way dithering works, the entire process needs to be done in a single thread. CodeLab could not handle making effects work this way. So, I modified CodeLab to add the option to the build screen. Once installed, you can find it in your Effects > Stylize menu. 4 Colors CMYK This is surprisingly good. I designed my own 16 color palette because I felt that the 16 color Window's palette didn't do a very good job dithering people. That palette lacks any brown colors. I also didn't like the blues that were chosen. So, I adjusted the blues and removed one blue and one green color to add in some browns. Of course, there are pictures where the Windows palette will render a better picture than my custom palette. But, for most pictures, I've found that my palette does a better job. CodeLab contains an option on the "save as dll" screen to force the effect to run as a single thread. Normally this is not a good idea because it slows down your effect. But, you can see here that it is necessary to process each row in order because values are being added to future pixels. Here is the complete CodeLab script for the dithering effect you can download above. //           Note: 7+3+5+1=16 so we divide by 16 (>>4) before adding. ; The alpha ('aa') value specifies how transparent a color is. FF is fully opaque, 00 is fully transparent. ; slots will be set to white (FFFFFFFF). If there are more, then the remaining colors will be ignored. Nice Job, BB. Brings back BBS memories. So if I Build my CodeLab dll with this version, and Force Single Threaded is checked, then it won't break the execution into several different chunks, instead running this all at once? I kindof need this as well, since what I'm doing is across the full image and selection shape won't really matter at all. I'll try this one out. It will always be broken in to chunks. Paint.net breaks the job into ROI (rectangle of Interest) blocks and feeds these to the render function. I recently got a pebble watch, and came across this amazing plugin when trying to make a custom watchface. I needed to dither an image, and this seemed to almost be able to do it. I edited the plugin with the Pebble Time palette, and figured it would be worth posting here. I've included the edited source, the icon, the palette text file I made, and the compiled plugin.